← CIA Releases 13 Million Pages of Declassified Documents Online. Eight Sided Star-Burst Lights Green Lines Connecting. 1ST PHOTO OF OBJECT. STARBURST DOES NOT SHOW UP. Description: I saw eight sided stationary star burst lights with center dot N sky about 25 Degrees. Green blue lines connected all dots. My sighting was about a week ago. I took a photo, but the flash took the colors away. The phone camera showed an oblong and square bright light with no other lights showing that bright. It was weird. I am 62 and have never seen anything like it. My sighting was about 2 AM in the morning. I live in Southern Wisconsin and the sighting was over Chicago area in direction. 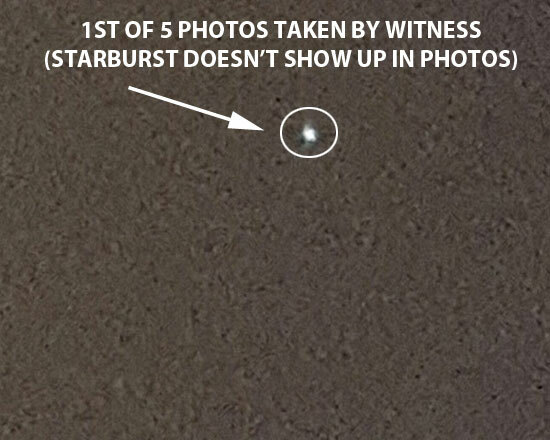 Response From Witness (With Photo Submission): The starburst does not show up on the photos. I took 5 photos. Note: The witness thought the photo taken of a green object over Llano, CA on Jan 11, 2017 was similar. This entry was posted in Formation of Lights, Octagon shaped, Orb(s) of Light, Photos, UFO Sightings 2017, UFO Sightings Illinois and tagged Blue colored, Green colored. Bookmark the permalink.